What with a new year upon us, I want to say a few things about that. This is the time of year when so many people commit to a word for the next year and/or a set of goals to accomplish in the various facets of their lives. I'm here to extol the virtues of not doing this, of leaving oneself open to whatever life has in store and dancing with that...instead of having a finely-honed plan of how one thinks things should work out and what one should accomplish. Should is the operative word, but you could easily use want or hope to here instead...or any other word that implies that we have control over life, when we all know that's just not the case. I've lived without goals for the last two years, and I'm a much better person for it. 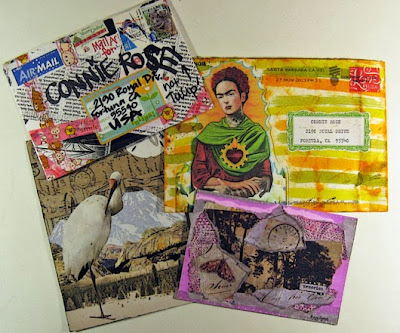 Had I gone into 2012 with a laundry list of things I hoped to accomplish as an art quilter, which is what I was up to creatively at that time, I wouldn't have found my way to mixed media, art journaling, book arts, painting. I also shaped the circumstances to greatly reduce the stress in my life by removing the ambition, the competition, the need to constantly fire myself up to create more-better-different. The same goes for having a special word for the year. I'd had enough years where I'd selected a word at the outset, only to quickly forget that word, then remember it somewhere middle of February and berate myself for forgetting or not doing all I could do to BE that word for the year. Better to strive to become a person with more inherent value...as in more serene, intrinsically happier, more content, mellower, more peaceful, able to live in the now. 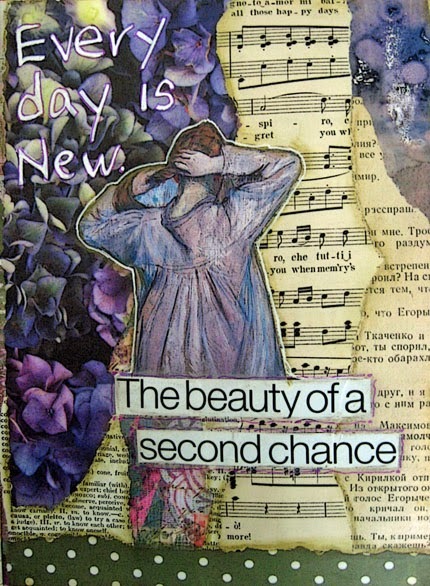 More confident that every day I am in the right place, doing the right thing, becoming more mySelf all the time. And knowing that this is what life is really about ~ not how well I stick to an adopted word for the year or how many widgets I create or how many shows I have or how much of my work sells. Moon Shadows is my third (and last, for now) book for Roxanne Evans Stout's wonderful The Thread That Weaves online class. 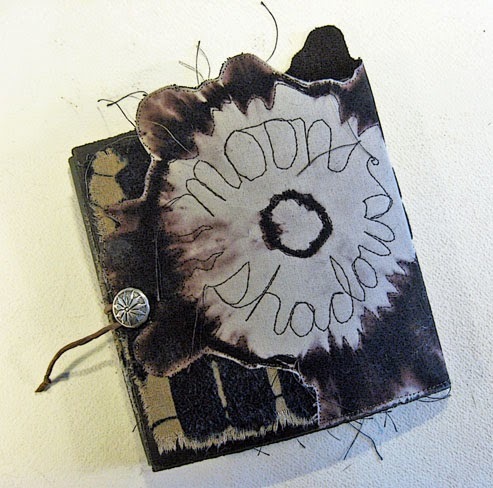 I knew right off that I wanted to make one of the books dark, and it came together virtually by itself once I'd pulled scraps of discharged fabric to use. For those who might not know, to discharge means to remove color from fabric, usually commercial black fabric. There's a lot of free motion quilting here. 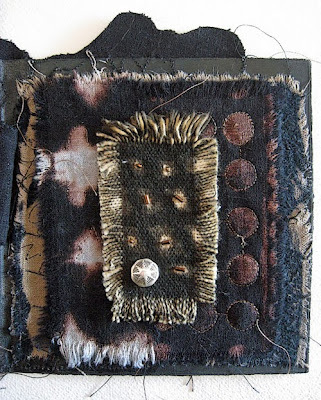 All of the fabric is of my own design, except for the three small pieces of genuine mud cloth on the inner pages. Plus, I was able to use some trinkets I'd been saving for many years ~ it's always nice to use up stuff you already have on hand. 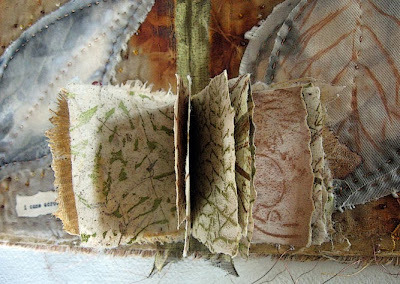 All of the pages themselves, inside and out, are torn pieces of discharged raw silk that were fused to the painted watercolor paper substrate. Commercial black raw silk is extremely difficult to get the color out of. Using bleach with silk is a no-no, except I did, in order to get the black dye to discharge, which left the fabric thin on the tan parts and therefore not really good for any application where fabric strength would be a necessity. 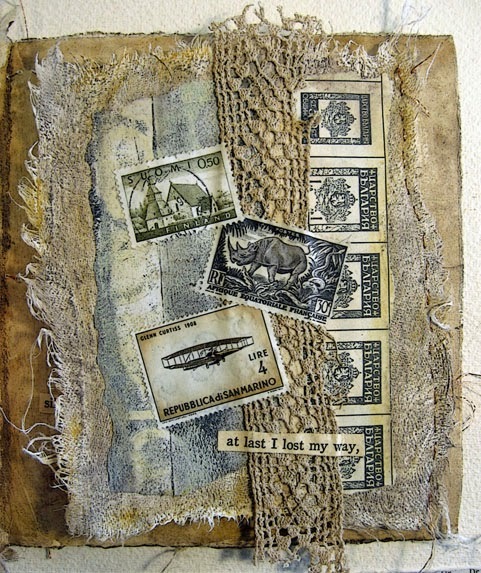 Tearing it up and fusing it to paper was an ideal use for this cloth. 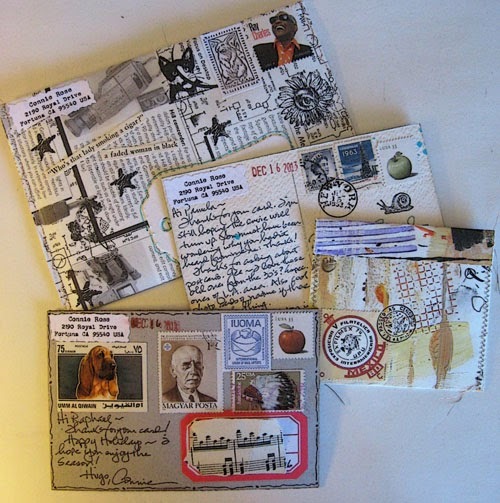 The outside rear and three inner pages are 4-1/2 inch square (approx.) quilts. I fused the two discharged fabrics to black flannel, then machine stitched the pattern lines. 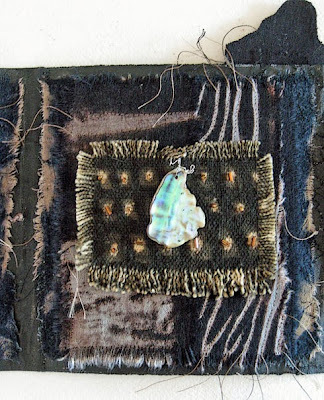 The mud cloth pieces were hand stitched onto the little quilts, then I added seed or bugle beads and an embellishment. This is inside page left with a silver button added. Inside center, with a beautiful chunk of abalone shell. Inside right, with another silver button. The centerpiece on the outside rear panel includes a sterling brooch that I've had for many years. The pin back broke off eons ago. That's genuine old Roman glass in the center. 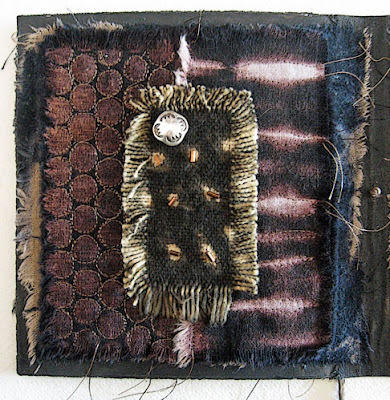 The Thread That Weaves is a terrific class...highly recommended. 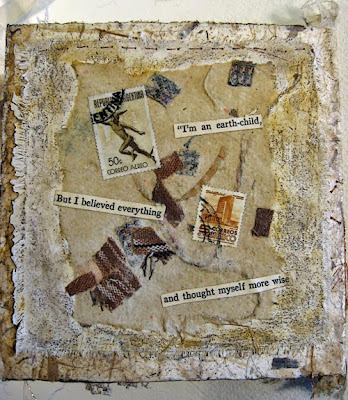 I learned a lot about putting disparate elements together, especially scraps and leftovers, and creating something new and exciting. 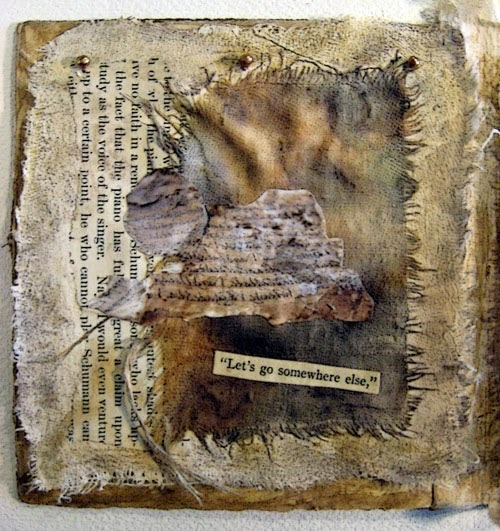 So goes mixed media. 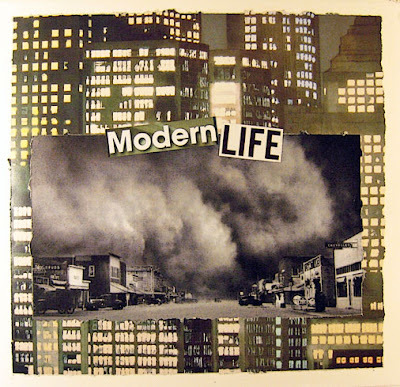 I could have called this Modern Life ~ Today and Yesterday. 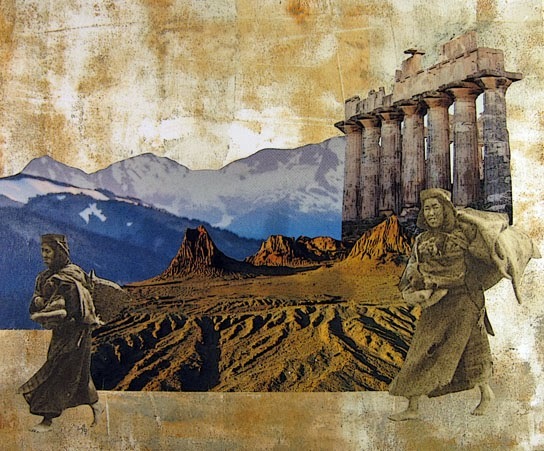 I love juxtaposing images in creative ways. 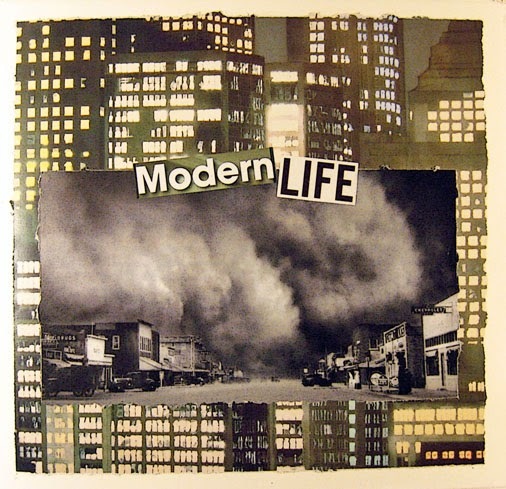 This is the opening page of my new art journal, which I think I'll call Modern Life. I mean, why not? As mentioned previously, I plan to do numerous things in this journal. 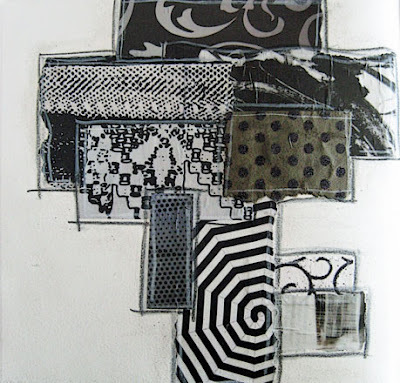 But the theme or thread that weaves it all together is that everything will be in neutrals. 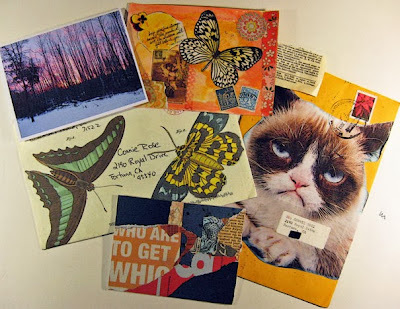 I've always been a big fan of neutral colors, despite my forays into rainbows and wild colorways, and the 61 small collages I did last summer for the 2013 Index Card a Day Challenge sealed the deal on this new journal. It just took me a few months to begin. Click the link to see what I did for that challenge. All of those pieces are about 4 x 5 inches, whereas the pages in my journal are 9 x 9 inches. 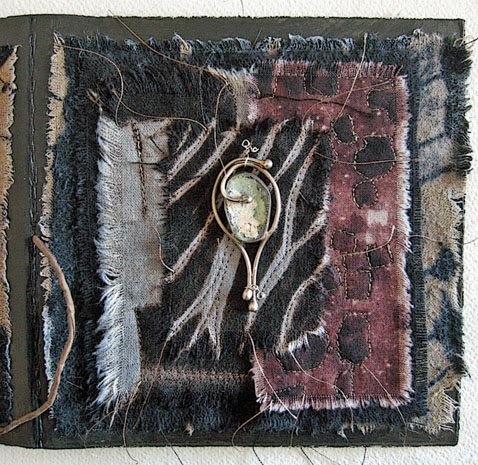 I completed a third Thread That Weaves triptych book yesterday and will post it tomorrow. I think it's my favorite of the bunch. 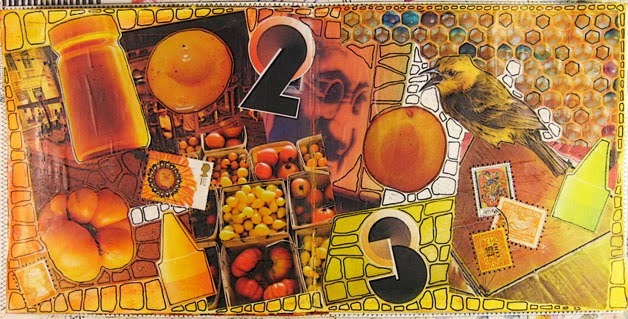 This is the last collage from this particular art journal. I just began my new art journal yesterday ~ I've planned that it be some collage, some painting, some of both, and maybe other mixed media thrown in. We'll see how it develops. Hope you have a lovely weekend, leading up to a warm holiday celebration next week, whatever it is you celebrate, including the winter solstice today. I'll be back on Monday with something new. The substrate is 140# watercolor paper that was gessoed on both sides. After drying, I covered the outside with my all-time favorite home decor fabric, best seen in the last photo below. I love this fabric so much, I've got it in numerous places around my home, including a standing lamp that I covered with it. Back to the book ~ the inside was aged with acrylic paint. 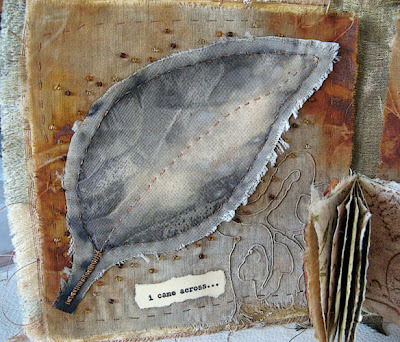 Rather than hand stitching a single line of thread on this book (the thread that weaves) as I did on the first one, I machine stitched the leaf patterns on the outer fabric. You can see a little of this in the last photo. That stitching is also the source of the fine copper threads hanging off from all sides of the book. The pages, three inside and two outside, began as torn pieces of tea-stained patterned raw silk that I stiffened with matte medium. 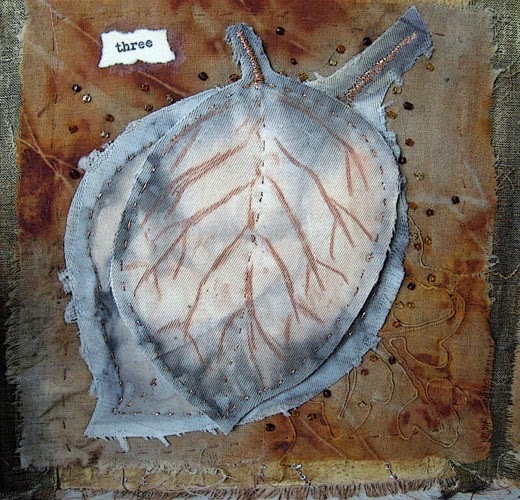 The three inner pages then had torn pieces of a vintage linen ecodyed handkerchief hand stitched on; then I hand stitched a leaf cut from a piece of ecodyed rayon; then stitched on a sprinkling of seed beads. The center leaf, above, was really light in color although otherwise perfect. So I cut an additional leaf, backed it with other ecodyed fabric, used cotton flannel for a batting, and hand quilted it. The outer leaf is merely tacked on at the bottom of the stem so it can be lifted up. 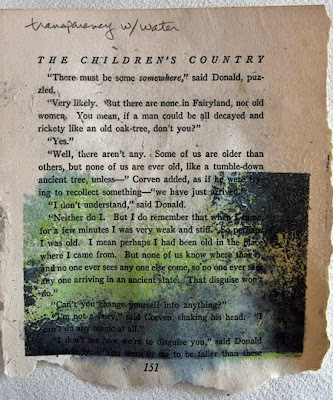 I typed the text myself, on the wide margins of an old book page. Hand typed with a typewriter on old paper makes the text look like it came from a book. The story reads, "On a path, in the woods, I came across three fallen angels. I rescued them." The tiny inner book has covers of a small piece of that stiffened raw silk mentioned above, on which I stitched paper and organza leaves, held in place with a single seed bead. 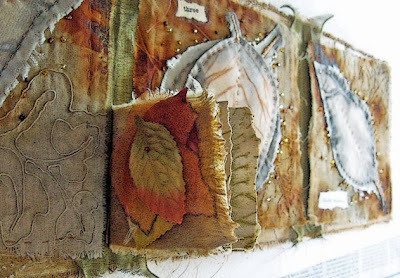 The interior pages are small bits of ecodyed paper and rice paper, both sides of which have leaf images created via rubbing plates and Neocolor I metallic crayons. Neocolor I are Caran D'Ache's wax crayons; Neocolor II are their watercolor crayons. The two digital images are my own photos from several years ago, photoshopped including changing the colors. 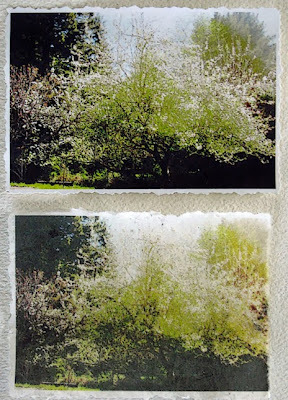 I printed the images on a transparency, then transferred to ecodyed silk organza with alcohol. I had a piece of newsprint beneath the fabric, and because organza is gauzy and there isn't much fabric for the ink to hold on to, the newsprint picked up the rest. In fact, I removed the organza after transferring, and kept burnishing the image onto the newsprint, so each image gave me two good transfers. I layered each set on the final pages so they have a 3-D effect. 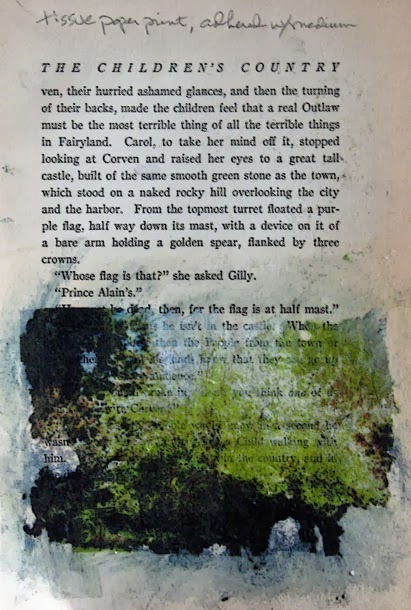 The digital images were fused together (I used Wonder Under; MistyFuse would work as well), then fused onto the page, then the page was fused to the book. Likewise, all pages were fused to the book itself. 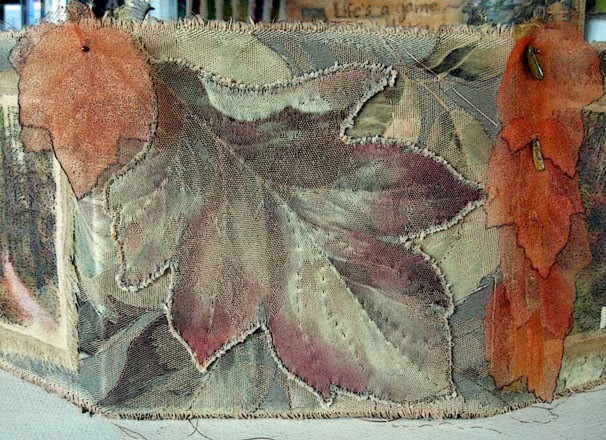 The center of the back has a hand quilted leaf from another piece of the foundation fabric, also fused to the backing. The final embellishment are the organza leaves ~ the two in the back are held in place with a single bead. 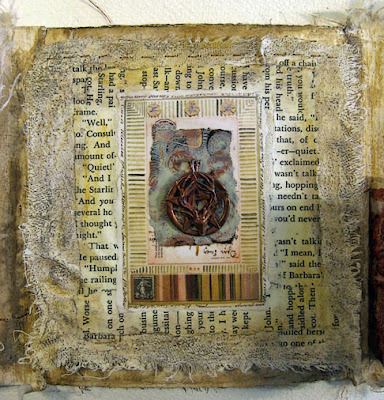 The four in front are attached individually to a short length of ribbon attached at the top of the book so it hangs loose. Voila! After a bit of a lull in the mail art operation, things have begun to pick up again. The pieces above were received over the last few days. The Grumpy Cat envelope walked its way to Fortuna from San Francisco, or it could have anyway...it was mailed the beginning of Thanksgiving week and just received. These are just a few received in the past month or so. And these were outgoing early this week. I'm still at work on my second triptych-book for the Thread That Weaves online class. It's really creating itself, one step at a time, each thing I do prompting the next stage. I'm hoping to be finished by end of the week. I've nearly run out of photos of recent work to upload here, so I'd better get a move on. Blogging really does keep me moving forward creatively. This is my FINAL final rainbow spread, using the last single page and the inside back cover. I couldn't resist covering that remaining white space with a rainbow of images. The final spread in the Rainbow Escape...final, as in the seventh required spread, but I'll have a bonus spread tomorrow. This one is Indigo Violet and features a Top 10 list. 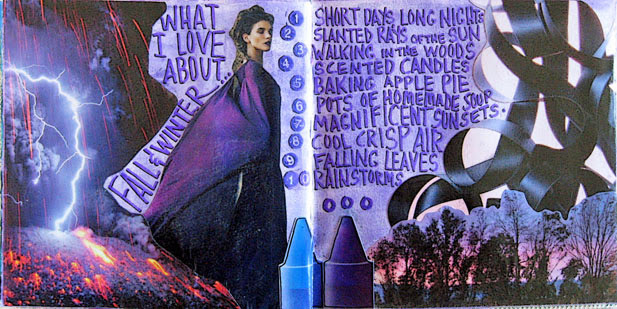 Mine is things I love about the fall-winter season. I have loved this challenge. 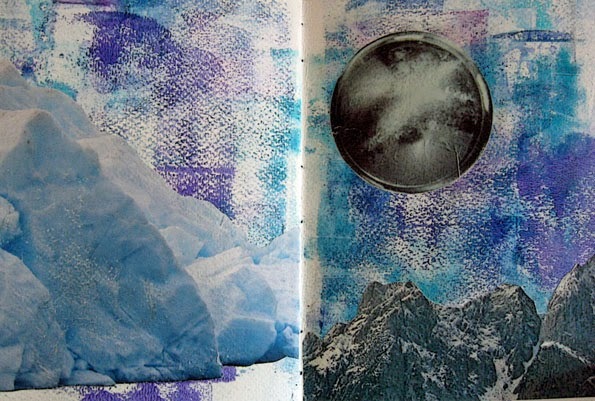 Here's my turquoise indigo spread for the Rainbow Escape challenge. The technique was to use fancy hand lettering with a brush or calligraphy pen. Believe it or not, in my entire pen collection I don't have a single calligraphy nib. So I used a brush pen with my own cursive, which I rarely use on journal pages. 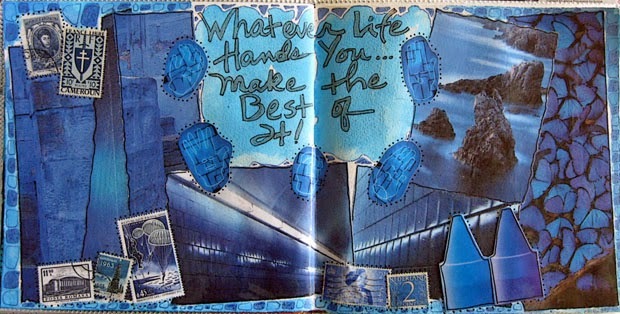 The saying, "Whatever life hands you...make the best of it!," was inspired by those neon hands surrounding it. An interesting note here ~ that Christmas stamp, in the center of the lower left cluster, is from 1963...that was 50 years ago, shortly after JFK was assassinated, and just a month and a half before the Beatles appeared on the Ed Sullivan show. 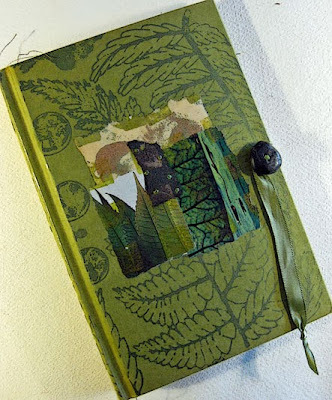 I mentioned a few days ago about wanting to create a series of nature journals. Since then I decided to focus most, if not all of the rest of my bookmaking escapades on nature journals. Meaning, I've finally found an area to explore content-wise. 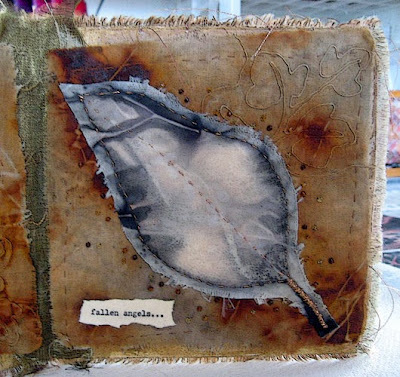 Thus far all my hand bound books have been "blank" in terms of content, despite the fact that most utilize recycled papers that have some text and photos on them. 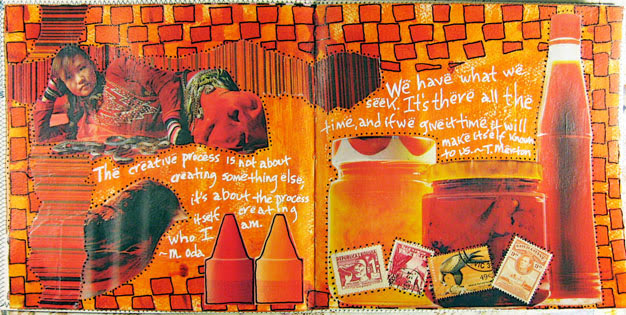 I always intended that whatever each got used for would become the content...like an art journal, or a travel journal or whatever. But I've done a lot of those already -- likely more than I can use up in my lifetime, especially since I continue to create project-specific journals (like the Rainbow Escape one I'm close to completing). So now I'm aiming my efforts toward nature journals. The journal above, which you saw originally early this year, has become my idea compendium and record of experiments toward this end. I added the rock button and ribbon closure yesterday. 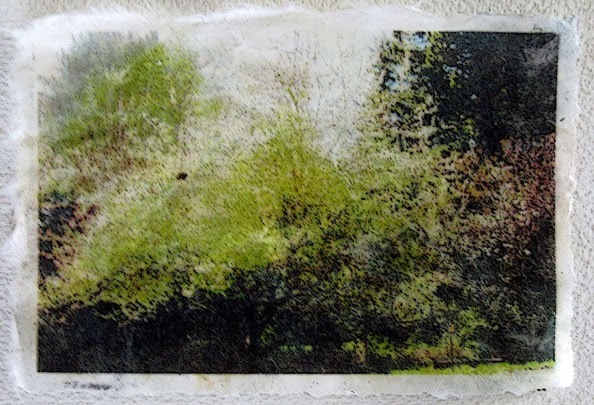 Yesterday I also did a bunch of experiments with digital print and photo transfers, using an image of mine from a few years ago. First, I applied a grunge overlay and saved the photo. 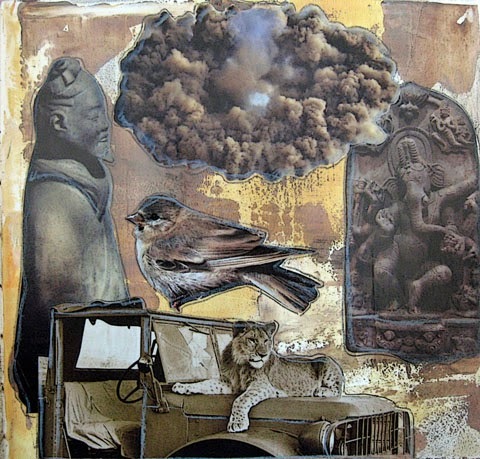 The first set ~ direct print on matte photo paper, and direct print on rice paper. Second set ~ direct print on glossy photo paper, and print on glossy paper scratched with sand paper. 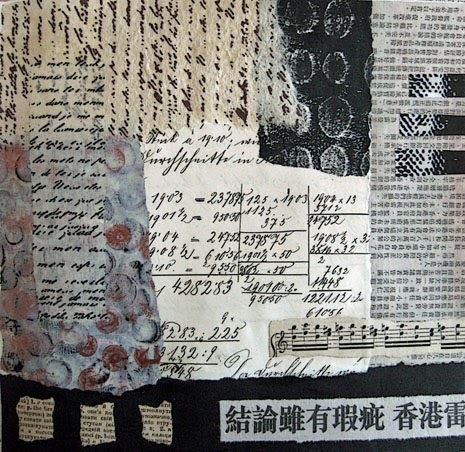 This was a print on tissue paper, adhered to the page with matte medium. I've had success with tissue paper prints before, but not this time. It might have been the old book page with a lot of fiber in it that didn't work well for this...I'm not sure. 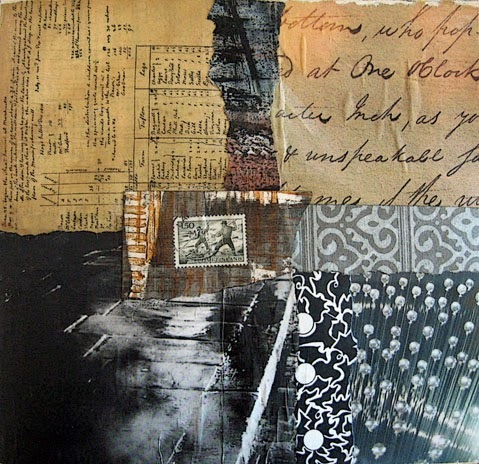 Previously I've used tissue prints on canvas as well as gessoed journal pages and had great results both times. I read somewhere recently about making transfers with alcohol gel (Purell hand sanitizer)...so I thought, why not skip the gel and just spritz alcohol on the receiving surface. Worked perfectly! 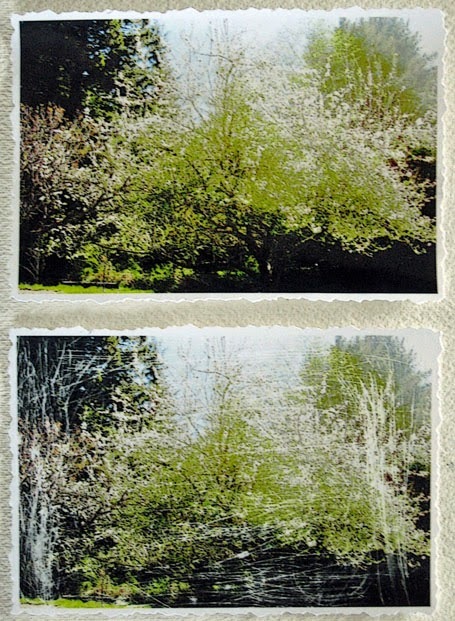 This image was printed on an Apollo transparency, applied to rice paper that was spritzed with alcohol. This might be my favorite transfer. Apollo is a brand of transparency. It was recommended when I first began experimenting with photo transfers a few years ago, so I don't have any idea how well other brands would work. I've never had luck with the oft-stated method of printing an image on cheap glossy paper and transferring the image with water onto a receiving surface. It's really hard to find cheap-enough photo paper these days, that is, paper that doesn't grab the ink and hold on. I did try it again yesterday, but, as before, it didn't work. 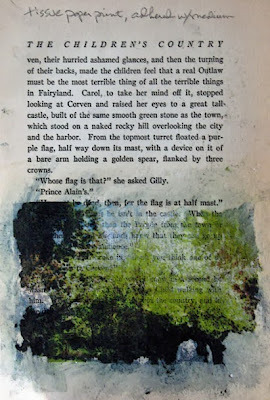 This image to the right was printed on transparency, then transferred with water onto the book page. Water/transparency works fine; water/glossy photo paper does not (in my experience). The last image is a transparency image transferred with alcohol. I like the photo transfer results with transparency and alcohol the best. I'll stick with this method. 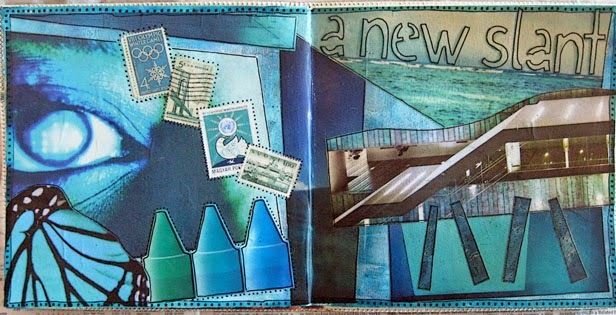 Today's journal spread, blue green, features words using an alphabet stencil. This one might be my favorite so far...it's the turquoise. 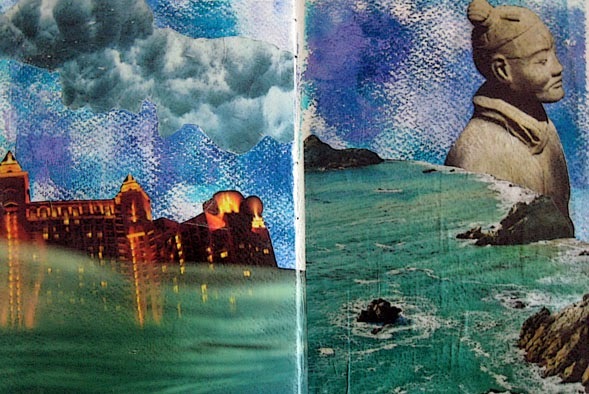 The next December Rainbow Escape journal spread. As you see, I'm following the color wheel in order rather than jumping around. I love things organized by color, rainbow-wise, and a journal like this is no different. The technique on this spread is doodles. I've used my favorite space-filling doodle, wonky roundish shapes. 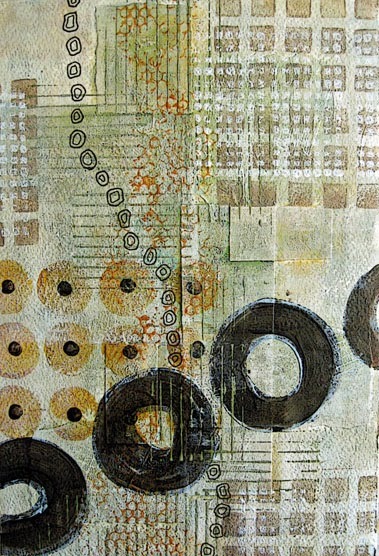 This was also my favorite way to fill in art quilt backgrounds, with wonky quilted circles. 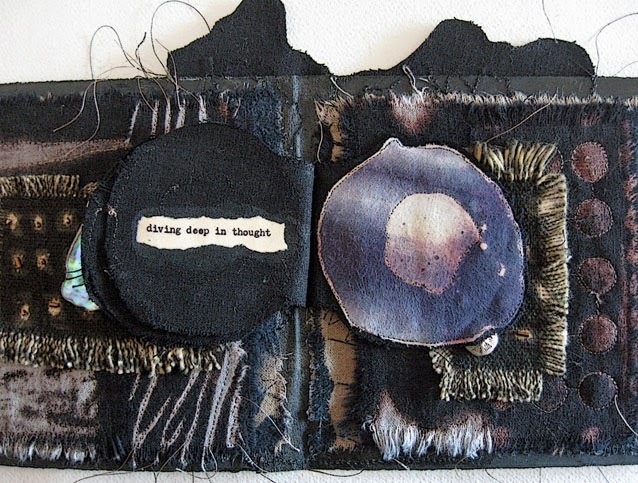 I've been messing around with ideas in my head for a second artist book ala The Thread That Weaves. If you missed my first book, you can see it here. This one will be nature oriented, that much I know. 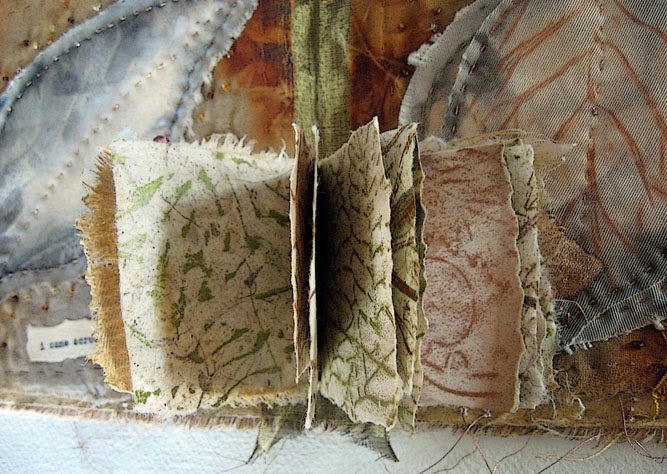 I'd actually like to do a series of nature journals with different styles of bookmaking, and I'll begin this journey with a triptych. This is a 7-1/2 x 11 inch painting I did while taking Jane Davies' class recently. 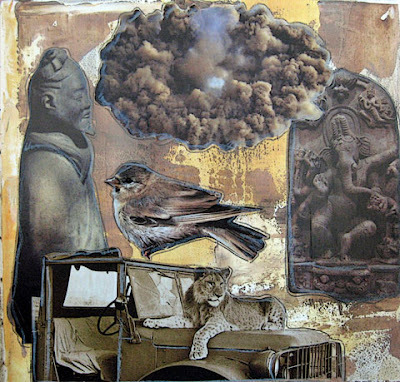 The substrate for this piece was a torn-paper collage I did while I worked with Jane's Scribble Collage DVD, earlier in the year. I painted over the base completely in creating the final piece. The watercolor paper here is cold press, hence the pebbly texture inherent in the substrate. For the more recent online class I was using hot press paper. I like both papers for this kind of work, each has its own beauty. I completed my first book yesterday for The Thread That Weaves. What you see above is the complete innards of the book, and beginning just below, each page from outside front to back. The last photo is a closeup of the little book stitched inside. 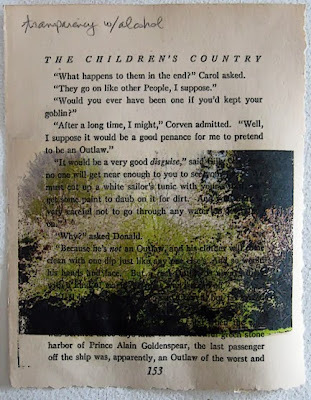 I decided to call the book Earth Child because I used a few lines of text from an old children's book called The Children's Country, and earth-child is referred to throughout that book. But really my book is devoted to wabi-sabi, an aesthetic centered on the acceptance of transience and imperfection. 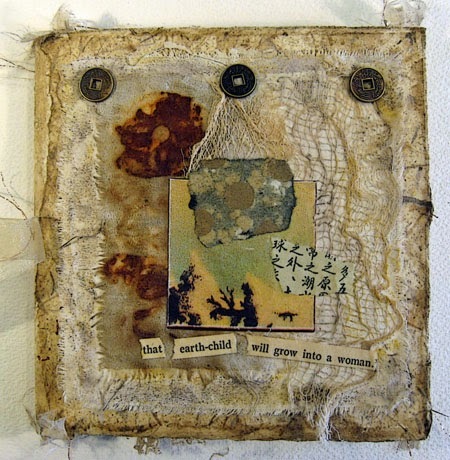 Wikipedia says this about wabi-sabi: "Wabi now connotes rustic simplicity, freshness or quietness, and can be applied to both natural and human-made objects, or understated elegance. It can also refer to quirks and anomalies arising from the process of construction, which add uniqueness and elegance to the object. Sabi is beauty or serenity that comes with age, when the life of the object and its impermanence are evidenced in its patina and wear, or in any visible repairs." 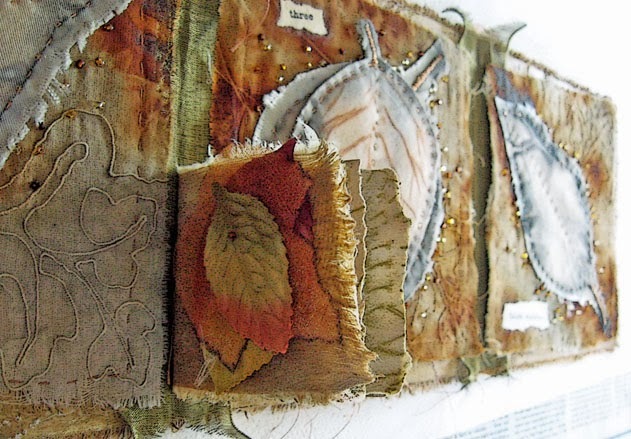 The pages themselves were made by building collages on gessoed fabric. I used vintage linen torn into approximately 5-1/2 inch squares. 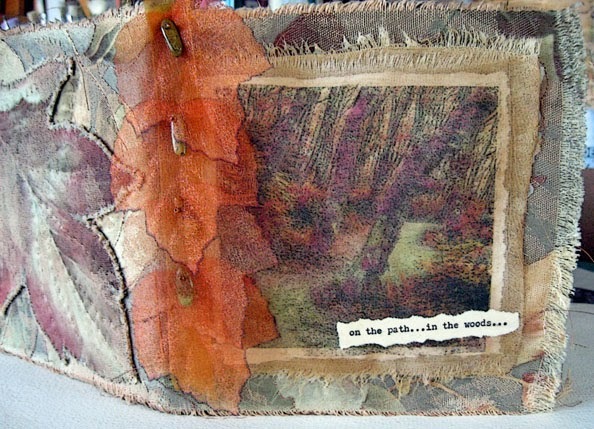 I used bits of old things throughout ~ old book text, eco dyed fabric scraps, an old copper amulet, lace, handmade and printed paper, postage stamps. 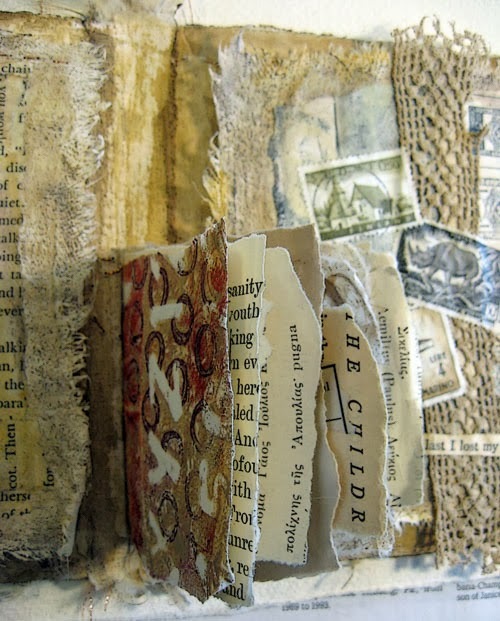 The three inner pages actually open up or to the side, and each face underneath has a scrap of paper and another line or two of text from The Children's Country. I used a heavy Gutermann copper sewing thread to hand stitch throughout. There is a swirly line of stitching on the book itself, underneath the pages, that runs from left to right. That line represents the thread that weaves throughout much of my life and my art, the wabi-sabi thread in this case. After creating the collages and gluing them down with matte medium, I aged the pages with Neocolor II crayons and a bit of moisture. The gesso I'd used on the pages had a lot of tooth in it, so the crayons picked up on the grits now on the fabric...so they kind of look like stucco surfaces. 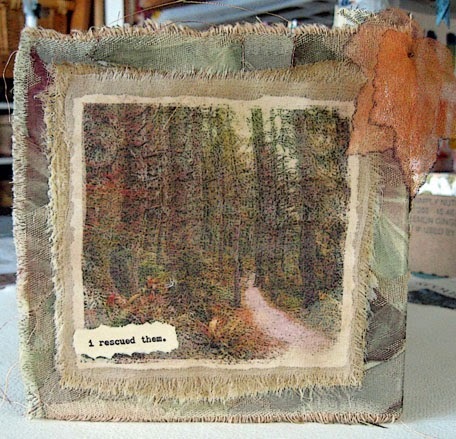 I used hand torn pieces of old text and a couple other things for the little book. The front side of each page has a smaller bit glued onto it. No rhyme or reason, just bits and pieces. Like the rest of the book.